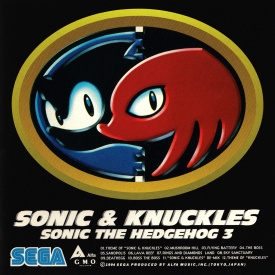 Sonic & Knuckles Sonic the Hedgehog 3 is a soundtrack album containing the music to the game Sonic & Knuckles. Instead of recording the songs directly from the Mega Drive hardware, the songs were completely re-sequenced. This allowed the tracks to be given the Sonic the Hedgehog Boom treatment, where some tracks are extended or stitched into medleys. Although Sonic the Hedgehog 3 is in the title of the album, the only music on the soundtrack is from Sonic & Knuckles. The reason for Sonic 3 being mentioned is most likely to have the two games tie together for marketing purposes, as Sonic & Knuckles is essentially the second half of that game. This page was last edited on 29 December 2018, at 21:44.